I’m basing this loosely on the template for my guide to hiking and trail running in Eastern Switzerland, but with some changes. Rather than posting routes, I’ll post a description of the trail system, along with a few other pieces of information: can you rent equipment there? What’s the train connection? Where can you leave a bag with your wallet and dry clothes? I give directions and time estimates for arrival by public transportation; check the SBB schedulefor exact information about connections. Especially for the lower-elevation areas, it’s important to check ahead of time that the trails are actually open. Most websites have up-to-date reports on the trail system. I also sometimes find it useful to look at webcams to roughly gauge the snow conditions. Another important piece of information is regarding trail passes. You can purchase a “langlauf pass” from Langlauf.ch (including in an app on your phone) for 140 Francs that is a season pass for every cross-country ski area in Switzerland. Day passes are usually around 10 Francs, although some places like Davos-Klosters are free, so depending on how often you ski this can be an incredible deal. As with the running/hiking guide, this is not an exhaustive list. There are some places even quite close to Zurich that I’ve never skied! I’ll start with my top two suggestions: one very close to Zurich which still offers great skiing, and another if you’re willing to spend a bit more time on the train, but still an easy day trip. These are shown with red markers on the map below. After that, I’ll arrange my other favorite places to ski based on their proximity to Zurich; these are in blue in the map below. Finally, I list some other places that you could explore if you have more time, get bored, or the weather isn’t great in any of the places listed above. These are less favorite spots or places I haven’t yet been, but have heard are nice, and are shown in gray on the map below. Below the jump, all the info you need! Distance & Directions from Zurich: 45 minutes each way on the train: Zurich HB – Einsiedeln, with a connection in Wädenswil. From the train station in Einsiedeln, it’s a 10-minute walk up to the trails. Enter “Schwedentritt” or “Parkhaus Brüel” into Google maps, or see this diagram. Rentals? Yes: 30 Francs/day; lessons and courses also available. Info here. Bag drop? Yes, two options. There are heated men’s and women’s locker rooms in the underground parking garage where the trails start, which have small lockers to leave your belongings (a 2-Franc coin is needed). There’s also a large wooden trailer with built-in shelves at the start of the trails where people leave bags, shoes, etc. It is not locked, but I have never heard of any issues with theft. Make your own choice. Trail pass? 10 Francs for the day if you don’t have the Swiss season card. Description: Schwedentritt is what I think of as my home trails. Easily reachable from Zurich, it’s a twisting and rolling loop that swoops from the impressive Einsiedeln Abbey down to the Sihlsee lake, then meanders around farmland, wetlands, and nature areas. There are some great views towards the mountains, but what I like most is just the terrain and openness of the trails. With lots of transitions, it’s really fun skiing, and gives you a great idea of the patchwork rural landscape of the cantons surrounding Zurich. The grooming is often great and you see lots of folks out enjoying the snow. The payoff in terms of quality skiing for short travel time from the city is really unbeatable. Distance & Directions from Zurich: An hour and a half to two hours each way, depending on where you want to start your ski. Either way, catch a train to Chur, and then make the connection (it’s just a few minutes) to bus 182 towards Bivio. You can get off the bus either at Parpan Post, Valbella Canols, or Lantsch/Lenz Biathlon Arena (see below). Website: An overview of the whole trail system is available on the Lenzerheide website (English/German), but it’s one of those interactive maps that I actually don’t find that helpful. This PDF version puts it all in one place. Rentals? Yes, from the cross-country ski center in Parpan (26-38 Francs, info here [German only]) or at the Biathlon Arena in Lantsch (info here [German only]). Lessons and other activities, like learning to do biathlon, are also available at the Biathlon Arena (info only in German). Bag drop? Yes. My preferred spot is to go to Valbella (get off the bus at Valbella Canols; map to the cross-country center is here). There is a small building with men’s and women’s locker rooms; you need a 2-Franc coin to get a locker. There is also a small kiosk/restaurant where you can grab food and drink while waiting for the bus. There are also reportedly locker rooms at Parpan and at the Biathlon Arena, but I haven’t used either of them; those areas likewise have food of some kind (bistro, cafeteria). Description: Lenzerheide is the place I ski second-most-frequently, behind Schwedentritt. It’s a bit farther away, but it’s really in the mountains and is spectacular; I don’t think you can get that experience (and certainly not World Cup trails!) anywhere so easily reachable from the city. 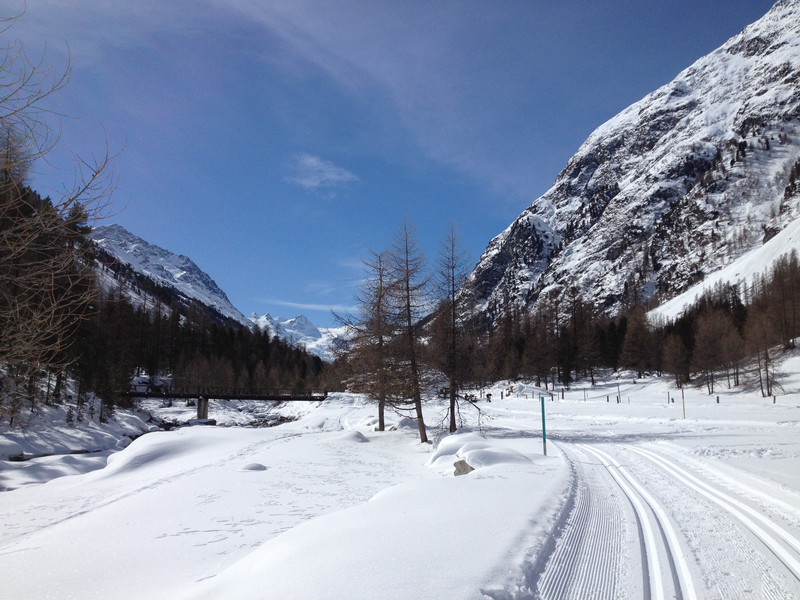 It’s a shorter trip than getting to Davos or the Engadin, but still has great trails of all types, and lots of them. 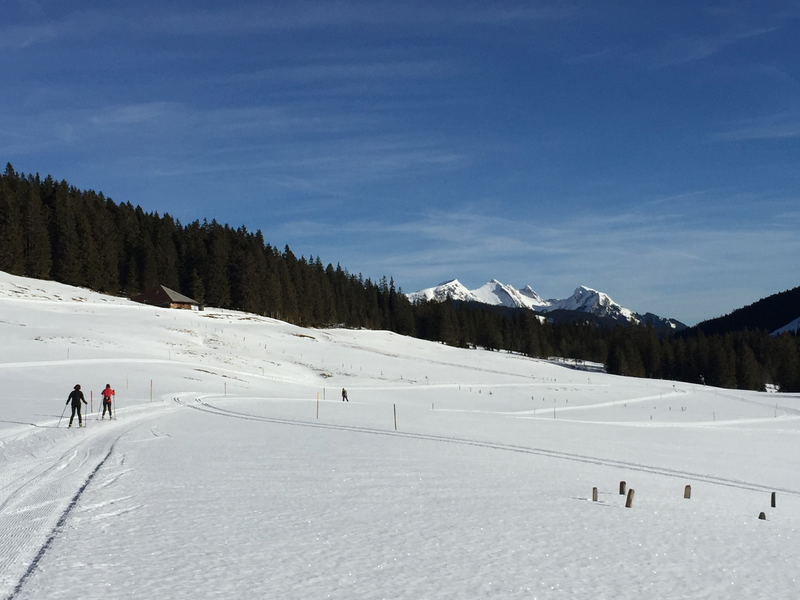 There are the World Cup ski trails at the Biathlon Arena, which are pretty hard, but also a long rolling loop between there and the town of Lenzerheide. My very favorite ski is going from Lenzerheide over Parpan (a big-ish and fairly steep climb followed by a fun descent) and out past Churwalden to the Capfeders viewpoint. You feel quite high up and eventually leave the alpine ski areas behind you to have some quiet skiing among the small alpine farms and patches of forest. On a sunny day, it’s absolutely the best. Distance & Directions from Zurich: An hour each way. Take a train to Zug, then hop on city bus 11 to Schönegg. Hop on the funicular and take in the view as it goes up the steep slope towards the top of Zugerberg. From the funicular, it’s a five-minute walk along the street towards to the start of the trails – head uphill to the left and then just follow the road. Description: The Zugerberg trails are really fun! They are rolling and relatively hilly, traversing a large hilltop/ridge area that offers views out over the lake of Zug and towards Rigi, Pilatus, and other nearby mountains. 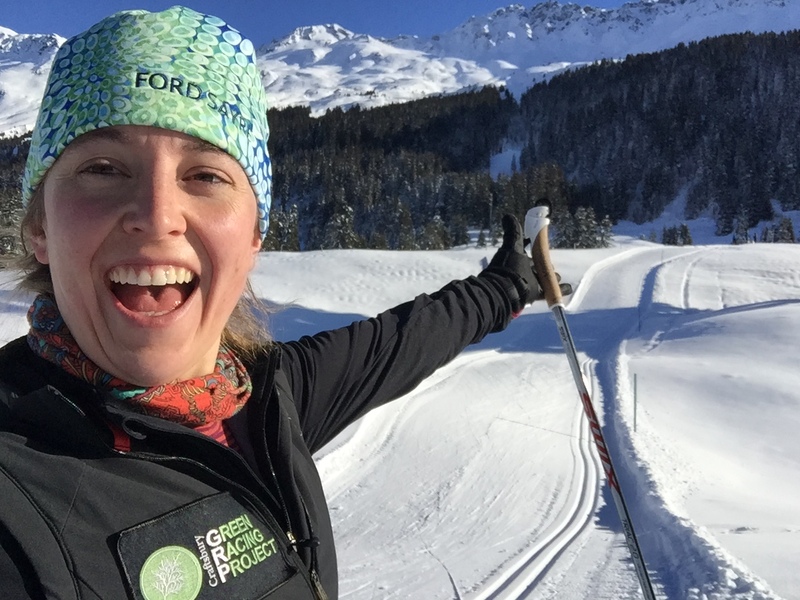 For me, it’s a great place to sneak off to if I can manage to leave work early – there aren’t unlimited trails, but plenty to keep you enjoying the skiing for an hour or two. The “Nollen” skate-only loop is fun and just be warned, offers some downhill S-turns through a huge, steep field – be prepared to make a lot of turns at high speed! 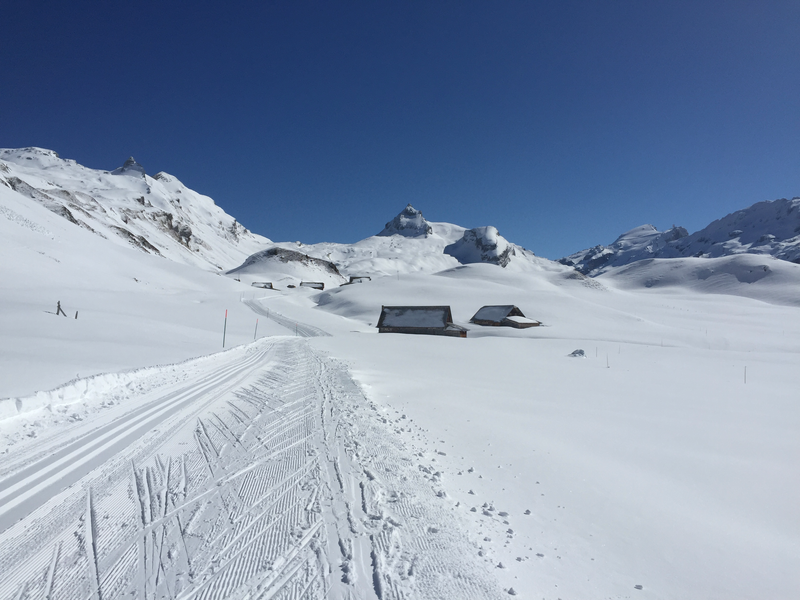 Because there is no rental place, it is often fairly quiet skiing, although the trial network criss-crosses with walking trails; you can also stop at a restaurant partway around if you would like. 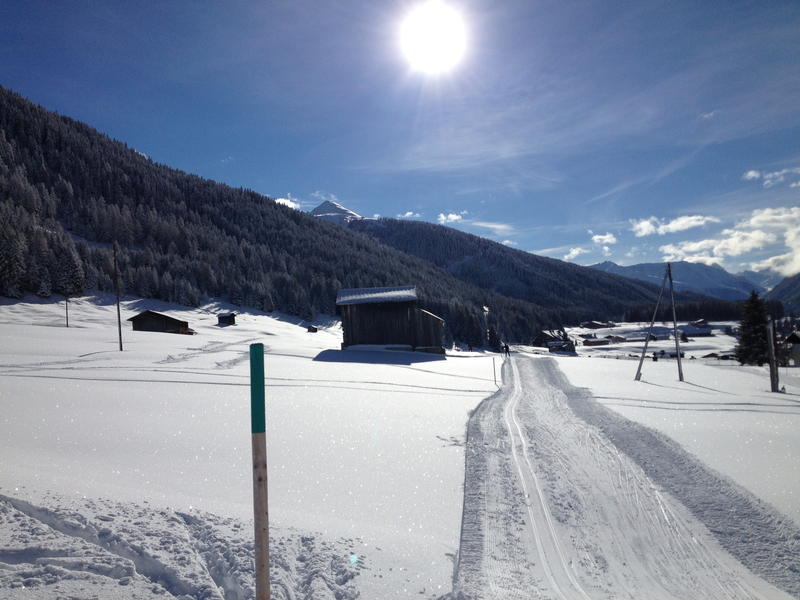 Unfortunately, in bad winters there often isn’t enough snow to ski at Zugerberg. 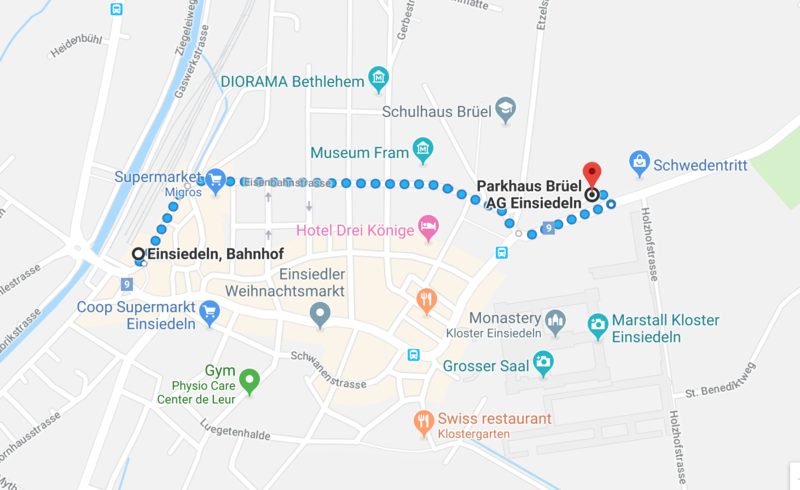 Distance & Directions from Zurich: ~1:10 each direction: by train from Zurich HB to Einsiedeln, connecting in Wädenswil along the way, and then bus 553 to Studen SZ, Dörfli. From there the way to the ski trails is signed. Rentals? Yes: 35 Francs/day for a skis/boots/poles set, less for individual components, from Schaad Nordic Sports (info here). You can also have lessons/courses, including the option to book them online, info here. Bag drop? Yes: in the basement of the nordic center is a large locker room area (including a place to wax skis and several showers). Lockers are free of charge. 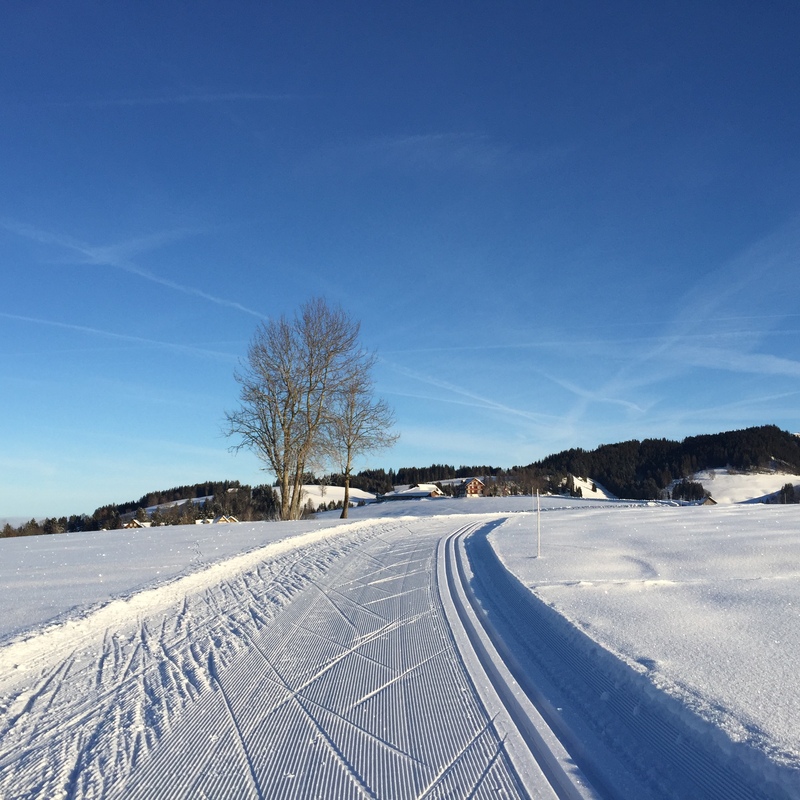 Description: Despite being only a 20-minute bus ride past the Einsiedeln train station, Studen often has earlier and more snow than the trails in town. The other reason I recommend it is that it has some of the best infrastructure anywhere. There is a fantastic nordic center built just a few years ago – a huge improvement from the dingy basement locker room available my first winter in Switzerland – which includes a comfortable cafeteria and Schaad Nordic Sports, which is where you should go if you need ski wax or other gear. The Schaads are very nice people and their shop has everything you could need, and they are happy to share their expertise. They even post a wax tip every day, which is really helpful if you live in the city and can’t tell what the snow will be like! The trail system has a couple parts. 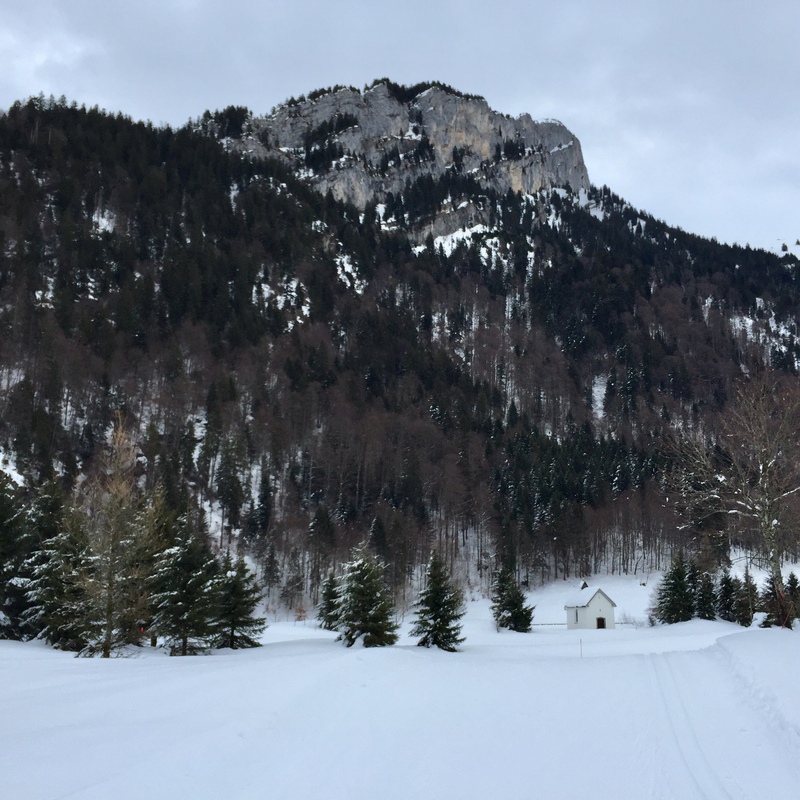 Most of the trails are in a wide, flat valley leading towards Hoch-Ybrig, an alpine ski area, so there are nice mountain views but very flat terrain. 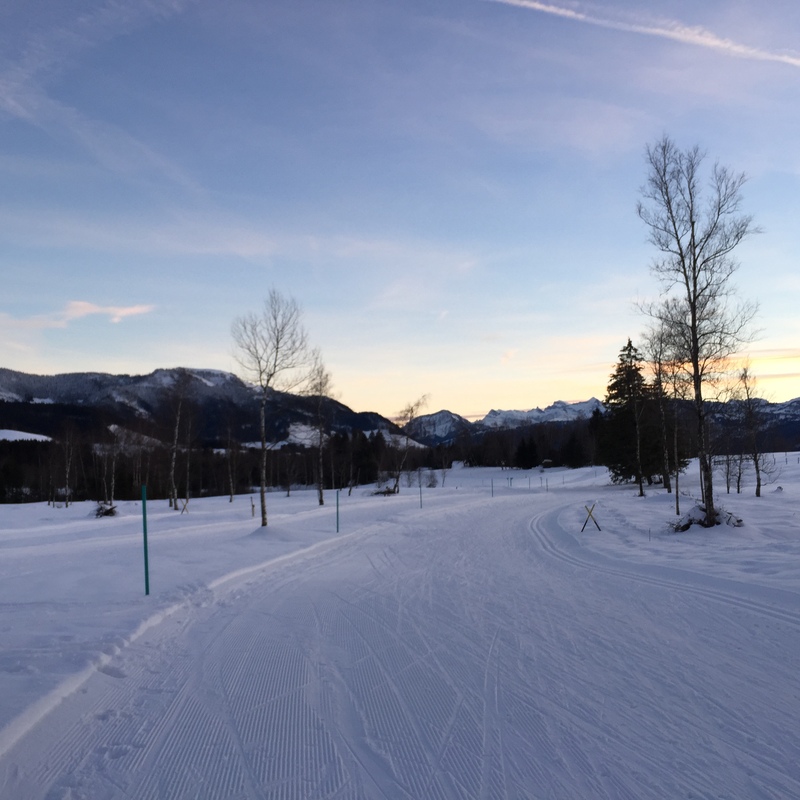 There are two loops, however, that offer more interesting skiing: a 7 km loop at the end of the Eastern side of the trails, and a 5 km loop at the end of the Southern side of the trails. Distance & Directions from Zurich: Just under two hours each way. Take a train towards Chur and hop off in Landquart, switching to a regional express train to Klosters Platz. From there it’s a ~5 minute walk to the trails (directions/diagram here). Rentals? 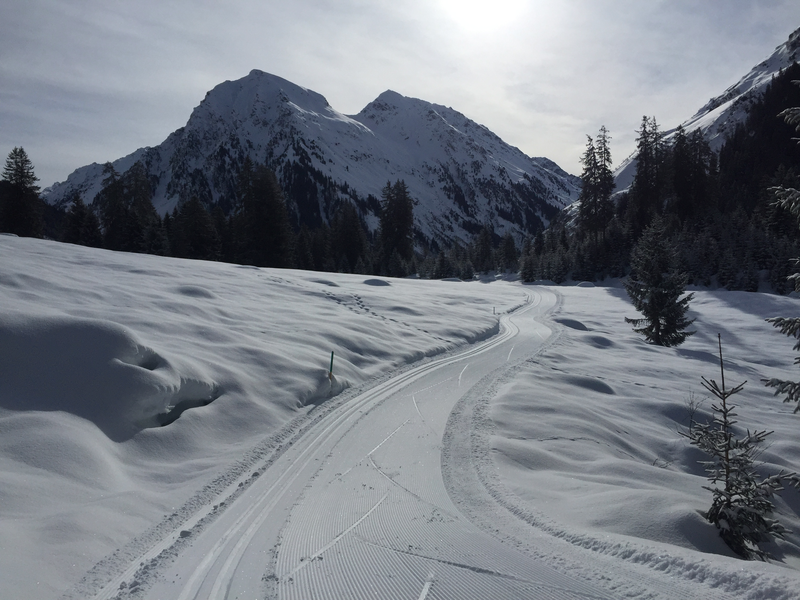 There are several places to rent equipment in Klosters, but they are not at the trail start – you will need to go to a shop in town. Here’s a list. Bag drop? There is a changing room at the Arena Klosters, the general sports building near the start of the ski trails. There are also lockers at the train station; I usually stash my bag there. You will need a coin for the locker. 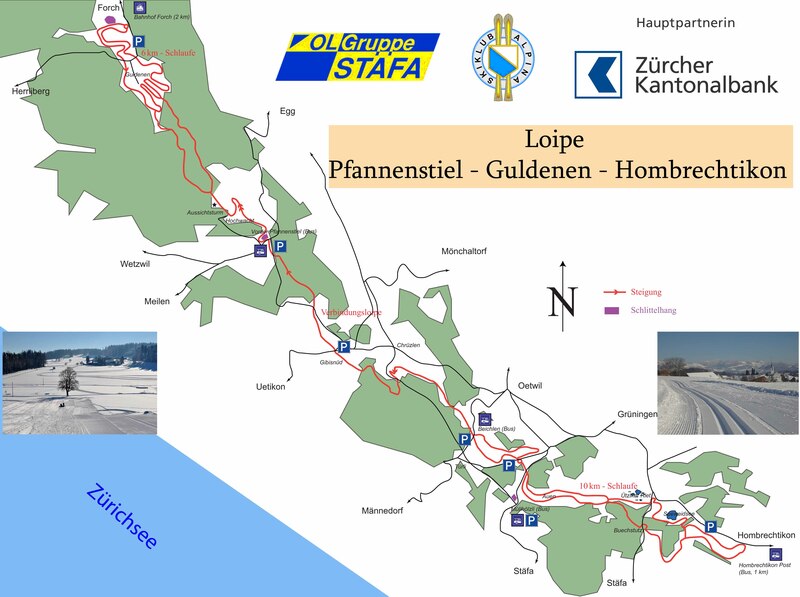 Description: Klosters is a nice, accessible mid-sized trail system. It begins with flat, easy trails along a pretty river, before the valley narrows and provides more interesting terrain. The quietest trails and most spectacular views are at the top of the trail system (map here, on the second page); this is the area where the train tracks have gone deep into the mountain through the Vereina tunnel, so it’s just mountains and a few alp farms. You can stop for lunch or a snack at Alp Garfiun and enjoy the views. The trip back towards Klosters is rolling at first, before hitting a fun, fast, and long downhill back – enjoy a rip! Distance & Directions from Zurich: About two hours each way from the Zurich main station. Again, check SBB because there are multiple connections that could get you to Sarnen, but that is where you need to go, before switching to bus 344 and taking it to the end stop at Langis. Rentals? Yes, at Freddy Glanzmann (info here) sport in the building near the bus stop. They also offer lessons, bookable online (info here). Bag drop? Yes, in the locker room of the hotel building where the bus drops you off. Description: Langis was a late discovery for me, but it’s a really neat area. The inner trail system is winding and fun, with separate skating and classic loops that traverse through meadows and forests and past a small chapel. There’s also a long trail out a summer road towards Lochalp, which is wide graded for cars and bikes, but pretty cool for a cruise. There’s no alpine ski area here, although a lot of people use the parking lot as a jumping-off point for ski touring; between that and being sort of in the middle of nowhere, Langis is a really nice, quiet, human-powered playground. Distance & Directions from Zurich: Two hours each way. Take a train to Sargans, then switch to bus 11 or 12E (check SBB) to get to Vaduz, the capital of Liechtenstein. At Vaduz Post, hop off the bus and cross the road to catch bus 21 going in the opposite direction, towards Malbun. Take it way, way up the hill to the stop Steg Hotel. From there it’s a 10-15 minute walk around to the touring center on the roads (diagram map here), or you can take a winter walking trail there (signed in pink), or pop on your skis and ski over with a bag on your back (there will be green signs pointing to the ski trails). Bag drop? Yes, at the “Loipahötta” hut. It’s a small hut and there are no lockers, but space to hang up a jacket, stash shoes, and leave a backpack; you can also buy a trail pass or a coffee. The bathrooms are in a separate building three minutes down the road (signs show the way). Trail pass? 8 Francs for the day if you don’t have the Swiss season card – and yes, the Swiss card works here too! Description: Want to up the number of countries you can say you’ve skied in? Head to Liechtenstein. It’s not a particularly long trip from Zurich, and the trails are lovely. They mainly meander along a very pretty small river, but there’s also some meadow loops. As Steg is midway up the road to a ski resort, but not there yet, it’s also a very quiet area where you can enjoy some quality nature time. I only skied there once, but I had an absolute blast. Distance & Directions from Zurich: ~2 ¼ hours each way. Take a train towards Chur and then hop off in Landquart. From there, check the SBB app: you may need to switch again in Klosters Platz, or you may be able to get a train that goes all the way to Davos Dorf. 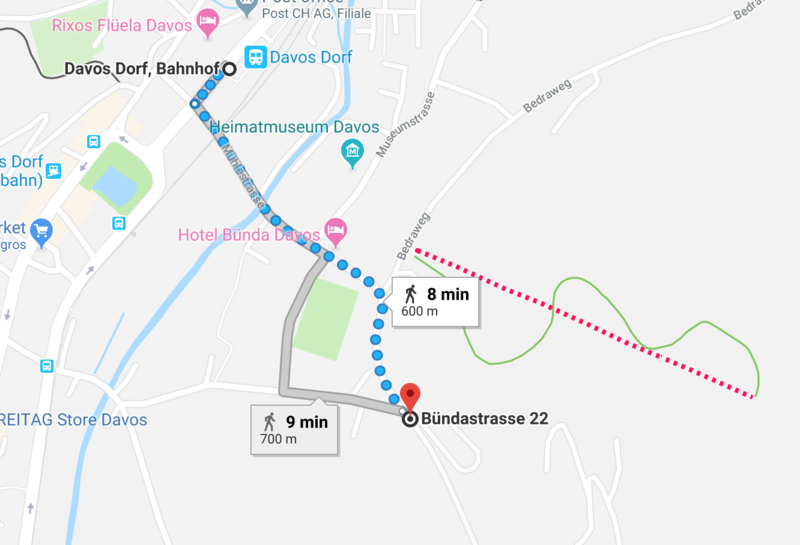 From there, the Cross-Country Ski Center– which is otherwise great – is a bit annoyingly situated (search for Langlaufzentrum Davos on Google Maps). So there are a few options. 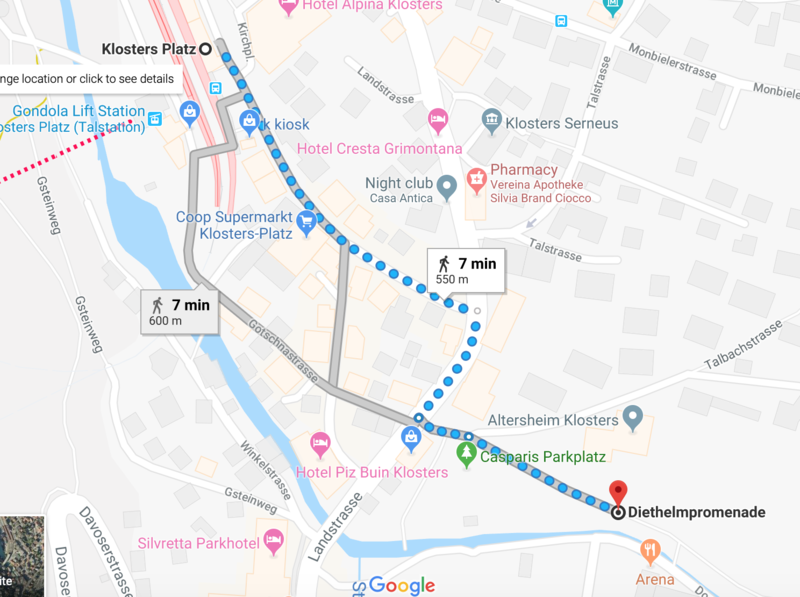 You can take bus 3 or 4 to Hertistrasse and then have a short walk. 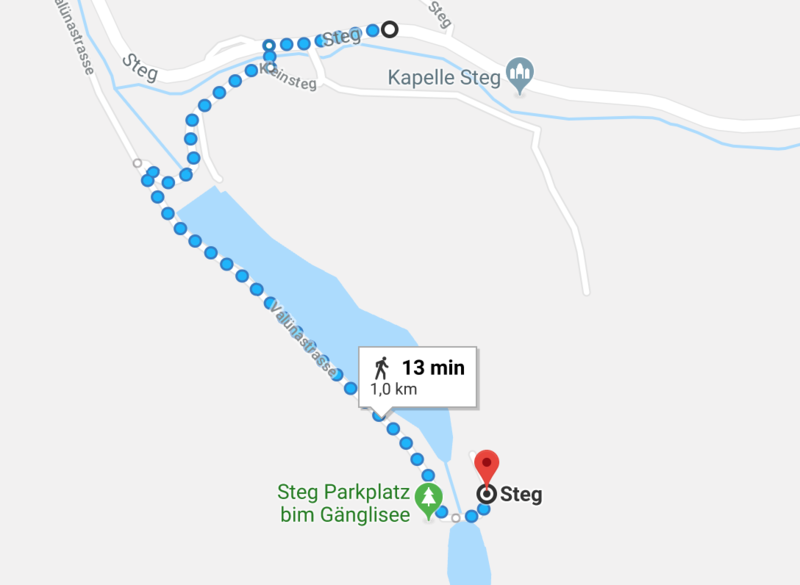 You can also walk to the ski trails (diagram here) and pop on your skis, either leaving your bag at the train station first or skiing with a backpack to the Langlaufzentrum. Rentals? There are several places to rent equipment in Davos, but they are not at the trail start – you will need to go to a shop in town (or at the train station). Here’s a list. Bag drop? As mentioned above, there are two options. You can leave a bag at the train station, for which you will need a coin to lock the lockers. There’s also nice changing rooms at the Cross-Country Ski Center, which also has a cafeteria where you can grab a bite. Description: Davos is one of the best places to ski. To understand how to make the most of the trail system, it’s helpful to understand the layout (map here). Davos itself runs along a valley, and the ski trails follow the river through this valley; different trails snake up side valleys, and these are the ones that people rave about. So don’t waste your energy down in town, get out to one of the side valleys, preferably Dischma or Sertig. The views up there are fantastic and both valleys feature restaurants at the top where you can refuel. The other reason that people rave about these areas is that these two side valleys have classic-only trails, which are just so fun. On skate skis, my favorite spot is down past Frauenkirch. There are, of course, also the World Cup trails in Fluela (which is also where the saved-snow early season loop is), but in my opinion they are not the most fun trails to ski, and don’t have the amazing views of the other side valleys. Distance & Directions from Zurich: 2 to 2 ½ hours each way. These trails are in the Gantrisch Naturpark, and are possibly the most annoying to do by public transport of anything I’ve listed here. There are many access points to the trails (shown here), but only one of these has both a bus stop AND direct access to the ski trails. That’s at Gurnigel Wasserscheide. Check SBB because there are several possible connections to get there, but it will involve a winding bus trip from one side or another. You’ll be deposited at a parking lot where you can see a small container/hut which signals the start of the ski trails. Rentals? Yes, but not at Wasserscheide, so if you are arriving by bus you need to arrive with skis. Bag drop? There is a very small changing room in the container/hut at the trailhead. No lockers, but you can leave a bag under a bench. Description: These trails are special because they are situated in the middle of a 400-square-kilometer nature park, while still not being too far from Bern, the Swiss capital. The network is laid out around a main trail, the 11-km “Königsloipe” or King’s Trail. From there, a series of peripheral trails loop up and down off the side of the ridge in either direction, offering a narrower and more technical way to enjoy the forest and catch some views. And the views are spectacular, looking out at the 2000-meter peaks of the Gantrisch massif. There’s a lot to explore and it’s worth the somewhat annoying bus trip to and minimal facilities to do so. Distance & Directions from Zurich: About two and a half hours each way, including the gondola ride up to the mountain station where the trails begin. Yes, a gondola ride to go cross-country skiing – for real! There are several ways to get there so check SBB, but you will need to get to Sarnen, where you will switch to bus 343 to Stöckalp. From there, take the gondola up. At the top station, take an elevator down to the floor below (weird, I know) and walk along a long hallway; the locker rooms will be off to your left. From the open area down there, walk straight out across a downhill ski/walking/connection trail and you will hit a cross-country-skiable trail that curls around and drops you down to the start of the real trail system. Rentals? I am pretty sure you can rent cross-country skis at the top of the cablecar… not certain though. Bag drop: There is a changing room at the top of the cablecar; you will need a coin if you want to use a locker. Trail pass? 8 Francs for the day if you don’t have the Swiss season card. Description: Melchsee-Frutt is one of my favorite places to ski in the late winter and spring. I guess it’s probably great the rest of the time too, but because the trails start at nearly 2000 meters (5,600 feet) and is nestled in the higher mountains, it holds snow a long time, and to ski it basking in the longer days and sunshine always leaves me feeling just so happy. The trails are well designed and graded, but not exactly easy; maybe it’s partly the elevation, but there are some big climbs, including right off the bat at the start of the trail. The views are just incredible though, so if you can use that as an excuse to stop and catch your breath. 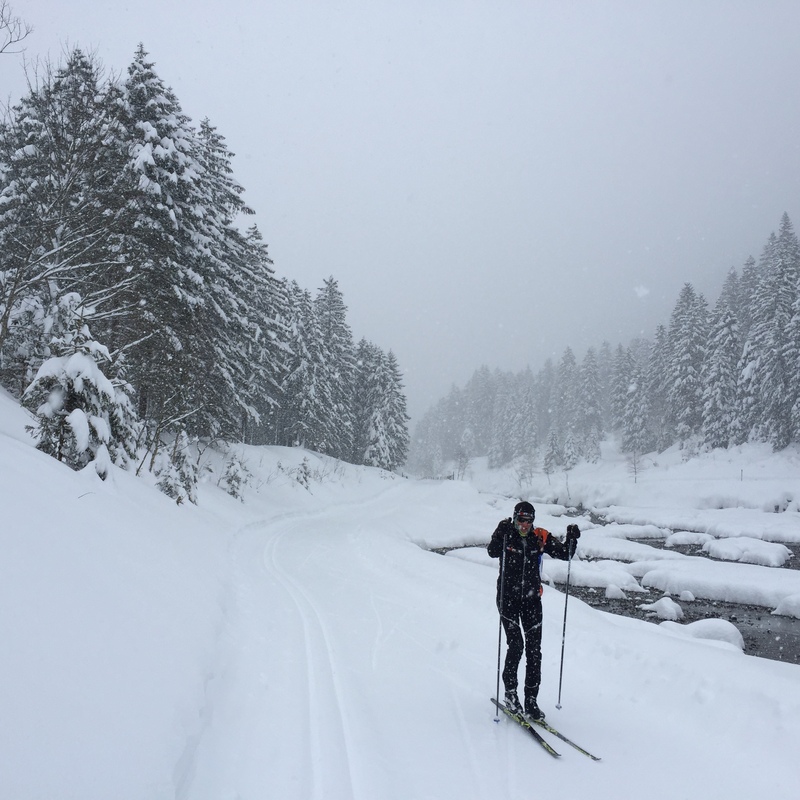 You will see lots of people walking, and sometimes people using the cross-country trails as an easy way to start their ski tours before skinning up the mountains. There’s a restaurant partway around the loop, too, where you can stop and have a snack in the sun. 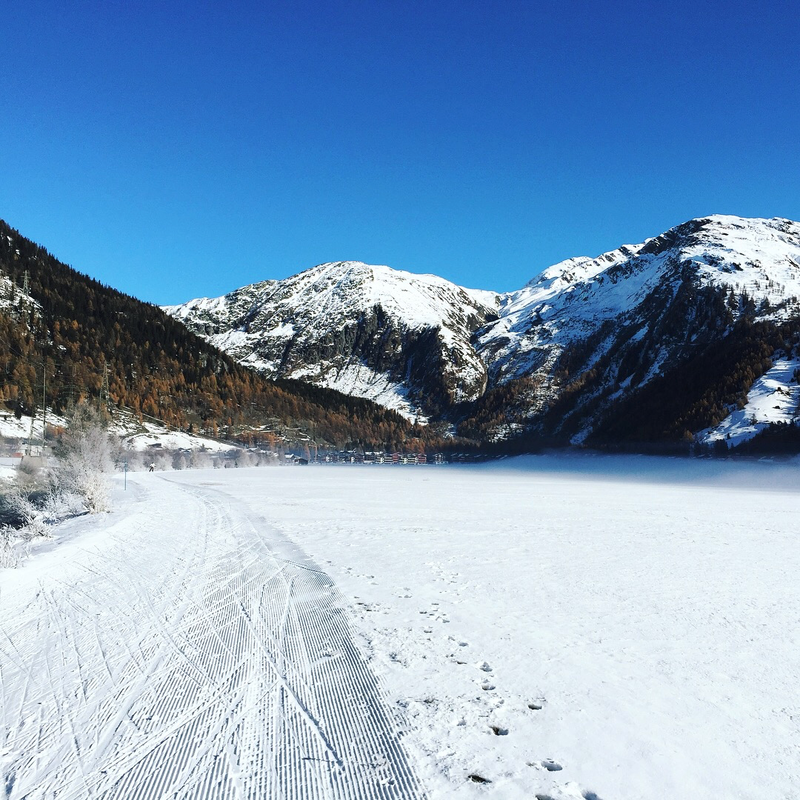 Distance & Directions from Zurich: I think if you’re going to go to the Engadin, you should stay at least two days, because there’s so much to explore! It’s 2 ½ to 3 ½ hours each way from Zurich. Almost the entire Oberengadin (Upper Engadin river valley) is covered in cross-country ski trails, so it’s your choice where to start (overview map here). You can choose Maloja at one end, Lavin in the Unterengadin, or anywhere in between. My best choice would be to go to Pontresina, which is closer to 3 ½ hours, but from where you have easy access to many of the best trail directions. Zernez is only 2 ½ hours however, and offers a lot of exploring at the less-touristy end of the valley. In both places, the ski trails are very close to the train station. Rentals? Yes, at many places throughout the Engadin valley (list here). Bag drop? Yes, at several places. At Pontresina, walk across the street from the train station and the cross-country ski center is in the basement of the youth hostel, where you will find locker rooms and bathrooms. In Zernez, there are changing rooms in the main sport center. In Samedan and St. Moritz, there are luggage lockers at the train stations which are probably the best options for where to leave a bag. You can use the interactive map to see the cross-country ski centers throughout the valley and check if they have changing room facilities. Description: As mentioned, the Engadin has just so many trails to explore. It would be a big challenge to ski everything there in one day! There’s lots of variety, too; a main trail meanders all the way down the river valley, crossing several frozen lakes along the way. But especially from the Pontresina area, there are also trails going up side valleys towards glaciers, which is an incredibly beautiful ski experience. The Engadin/St Moritz region is infamously one of the sunniest places in Switzerland, so it’s a very happy place to be. I’d go more often if it wasn’t so far from Zurich! Distance & Directions from Zurich: Three or more hours each way from Zurich. You can get on the trail network in many places, from Niederwald to Oberwald or anywhere in between (trail map here); the most developed part of the trail network is in Ulrichen, where the Nordic Center is and where races are hosted (directions from the train station to the Nordic center in a diagram here). All of these places are accessible by a train that runs up the valley, so use SBB to figure out your route, but it will either involve taking a train directly to Brig and then switching to the regional train to Goms, or taking a train to Flüelen, switching to a different train to Andermatt, and then catching the regional train to Goms. Rentals? 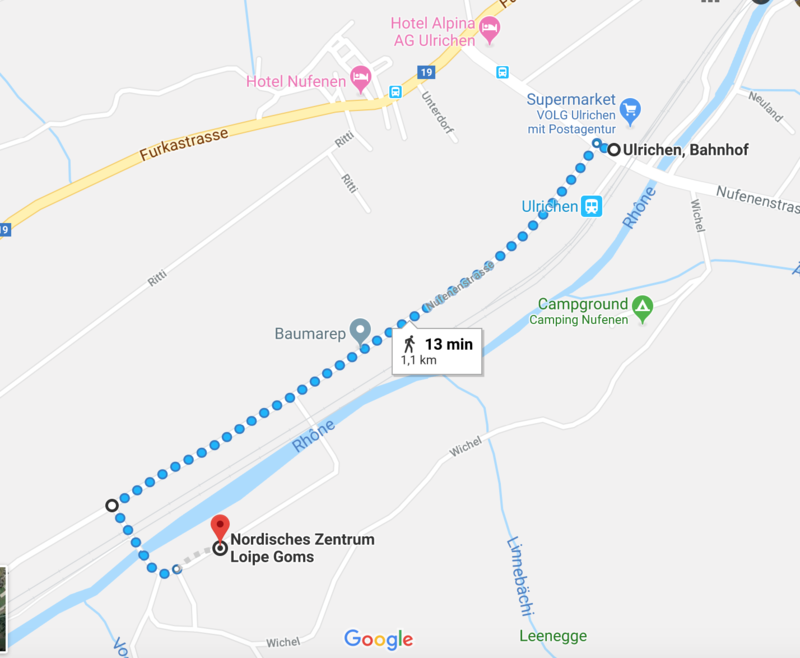 Yes, from many places in Goms, but not at the Nordic Center in Ulrichen, so you’ll need to make a detour (list here). Bag drop? Yes, there are locker rooms with showers at the Nordic Center in Ulrichen, There are also “garderobe” facilities in Niederwald and Oberwald. Trail pass? 16 Francs for the day if you don’t have the Swiss season card. Description: The trails in Goms often have early snow, and the long valley has an incredibly extensive trail netowork. They mainly follow along the river in the bottom of a valley surrounded by big mountains, but there are some loops which offer more interesting terrain. It’s a long way from Zurich and for me, if I’m going to spend that much time on a train I’d rather go to Davos – but Goms is a good option to get in a lot of kilometers and the weather can sometimes be better than in Graubunden, so it’s a good option to keep open. They also have a great marathon/half marathon weekend of skating and classic races, the Gommerlauf, which is a fun mid-sized marathon to check out. 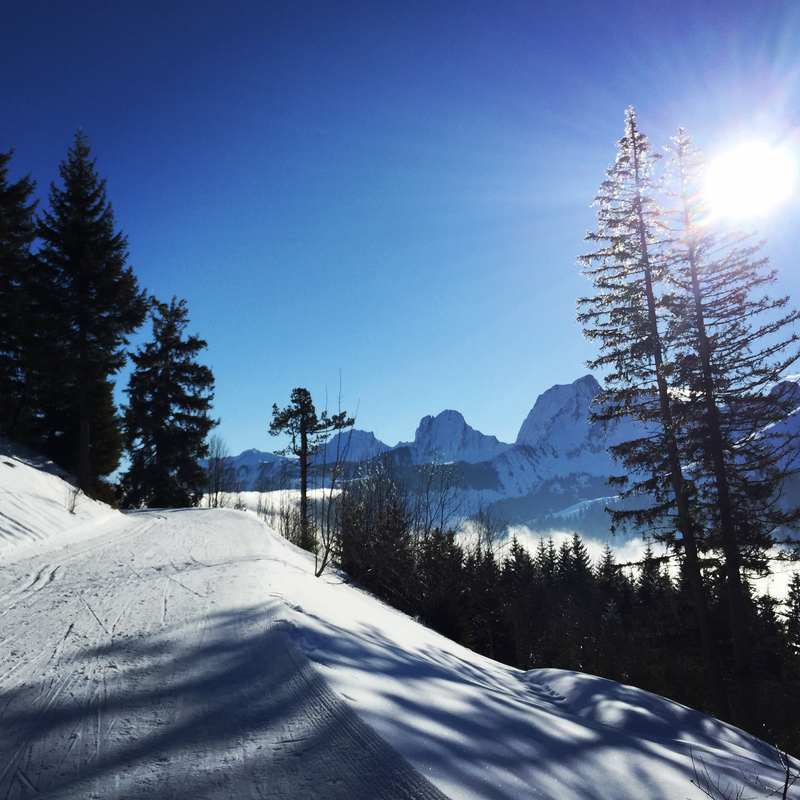 Romandie: For the north-center and north-west part of Switzerland, check out the website for Romandie Ski de Fond, which has interactive maps and lists all the ski areas. It’s a very useful resource, but I have found that reaching a lot of these places by public transport is not easy or convenient. Too bad, because they look great! A few are possible, if you’re looking for that area or the Jura seems like the place to find the sun on a given weekend.